Microsoft Working on Surface Smartphone: Nokia Relationship Souring? Reports from numerous sources, including Reuters, BGR & China Times, have stated that Microsoft is developing their own "Surface" branded Windows Phone 8 smartphone, aiming for a H1 2013 launch. This move would have major implications for Nokia, which is Microsoft's closest partner in the smartphone space. As compared to the OEM reaction to the Microsoft Surface tablet, I expect partnership dynamics to play out differently in this case. For most of Microsoft's OEM partners, Windows Phone is a very small part of their product portfolio. Therefore, they are unlikely to fear any competition from Microsoft. However, since Nokia has bet the entire company on the Windows Phone platform, the impact on their relationship could be significant. Microsoft is said to be unhappy with the market performance of the Windows Phone based devices. In addition to this, Microsoft is apparently also not too thrilled about the amount of focus Nokia put on Pureview for the Lumia 920 launch. Redmond seems to think that their partners should be pushing the Windows Phone brand, as opposed to an OEM-specific brand, i.e. Lumia/Pureview. This was the reason behind Steve Ballmer's ringing endorsement of HTC's new WP8 based devices, going as far as to call them "signature" devices. In response to these rumors, Stephen Elop recently stated that Nokia could do things with Windows Phone that Microsoft couldn't, most likely referring to their expertise in hardware & optics. Nokia seems to be focusing on Pureview for the WP8 launch because of the market's response to their initial Lumia launch, i.e. pushing the Windows Phone brand exclusively didn't really help generate sales. With analysts stating the need for a break-up sale to salvage shareholder value, Nokia finds itself in a desperate situation. Survival is a higher priority than their relationship with Microsoft. Given the limited Windows Phone ecosystem, any WP8 smartphone launch would have a direct impact on Nokia's sales. Although we've already seen some strain in the Nokia-Microsoft partnership, Nokia would most likely attempt to continue with their current strategy for now. 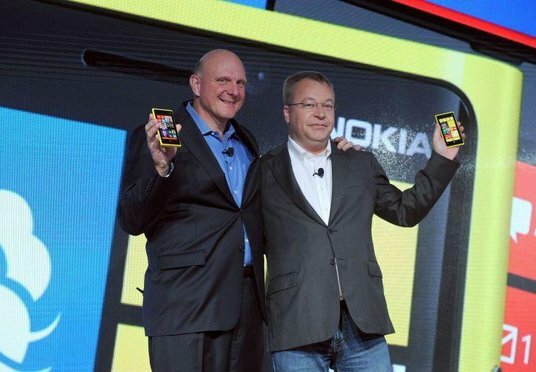 It would be interesting to see Nokia's reaction if the new Lumia devices also fail in the market. Nokia has stated that they have a contingency plan in case their WP8 strategy fails. That contingency plan could put their partnership with Microsoft in further peril. But unless that contingency plan involves a break-up & sale of the company, it may be too late to generate any shareholder value. Well, Elop wanted to join an eco system. First, eco-systems are alive, so you never know what might happen. Second, there's a food chain in any eco-system. Ever hear about it? Off the burning platform, into the fire. I think the biggest mistake Elop made was that he failed to recognize that Nokia was an OEM and not an integrated player. They were always known for their hardware, but there's little they can do with a handicapped ecosystem. They could've always hedged their bets on the OS. Now you have Ballmer pushing MS to be a "Devices & Services" company, so its only gonna get worse. I'd hate to be a Nokia shareholder.